We were on a 26 day road trip through Lucknow-Allahabad-Varanasi-Patna-Gaya as part of our ShikshaDaan Yatra. Even as we were confirming our hotel bookings, the first thing we checked with all the hotels is whether they have filtered or RO water and insisted that we would want our water bottles to be filled. Every single hotel was happy to oblige and some of them were rather amused that we were refusing the “mineral” water that comes in sealed plastic bottles !! We carry steel flasks and bottles everywhere and get them filled up. We refuse to use the 500 ml and 1 litre plastic bottles that are offered. I irritate many people as I start my lecture on why they shouldn’t use the plastic bottles and the harm that plastic does to the environment. It has gotten so bad that we were eating at Kashi Chaat Bhandar, the famous chaat shop in Varanasi and two sisters with their children sat on the opposite bench. I started off on my lecture about giving us filtered water rather than the mineral water bottle. They asked me a few questions and then said “are you a professor?” :). I said “no, but I give free ‘gyan’ whenever I get an opportunity”. We must have saved a minimum of 125 plastic bottles in this trip alone… at the rate of 4 lit water consumption by the three of us. All hotels must only offer filtered water to guests in large jugs. I keep saying filtered water because RO is a terrible process that wastes a lot of water and makes the water acidic !! We don’t use the shower in any hotel. We ask for a bucket and mug. If there is no option but to use the shower then we set it to the lowest output and use minimal water. Again the suggestion to hotels would be to remove the bathtubs … its a luxury that is affordable only after we have surplus water in the world. Filmstars and celebrities need to take note and stop using the bath tubs as it uses enormous quantities of water for a single person to wash themselves. Schools must teach children to take bath in half a bucket of water… that’s all it takes. We ask for towels and bed linen to be replaced after two days of using them. Most hotels change the bed linen and towels every day and washing them takes HUGE quantities of water ! My suggestion to hotels in India is to use the handloom thin towels, that take lesser water to wash and will help some handloom weavers. They are also inexpensive and absorb water much better than the thick “turkey” towels. Ideally hotels must place cards everywhere to inform guests that the bed linen and towels will be changed upon request. We don’t change our bed linen at home everyday … why do it at a hotel if you are staying for a couple of days or a week? I don’t know the origin of the “silver” service rules that make the waiters at high end restaurants to change a guest’s plate for every course. A single person eating at a breakfast buffet would end up using as many as 3 to 4 plates!. At every restaurant that we ate breakfast at, we ensured that at best we used four plates and never more than that. Again, the logic is, how do you eat at home? You use the same plate throughout. Imagine the amount of water that gets used across high end restaurants every day to wash plates and cutlery, just because of some archaic rule set in the 18th century. Humble request to 5-star hotels and high end restaurants – teach guests to use a single plate. People don’t have drinking water and some people are changing plates and using water that can quench a whole family’s thirst in cleaning those plates. Its criminal. All hotels have landscaped gardens and plants are watered everyday … Please use recycled water. Car washing – its inexpensive to get your car cleaned in India. We pay Rs. 600 for a month to have our car cleaned from the outside everyday and a couple of times from the inside as well. It doesn’t mean that we use multiple buckets of water to wash the car! Cleaning a car requires just half a bucket of water. Please read my blog given at the end of this one with more tips on water conservation. At the hotel in Varanasi, and the Airbnb stay at Patna, we taught folks how to clean the car with just half a bucket of water. We carry cloth bags on all our shopping trips – whether it is for vegetables or grocery. Vegetable vendors and shopkeepers were amused that we refused plastic bags. Its disheartening to see shopkeepers reaching out for a plastic bag on auto-reflex! The fruit seller in Bodh Gaya told us that people don’t buy from him if he doesn’t offer a plastic bag – the exact same comment that we heard in Chennai, Pune, Delhi, Hyderabad and many other cities. The TamilNadu government will ban plastic bags from next year ? !%*, why next year? Why not this minute ? Do they want one more round of floods ? The Maharashtra govt is facing flak for insisting on a ban of plastic bags – people suddenly talk of livelihoods being lost because plastic bag manufacturers will go out of business. There won’t be an Earth left for the next generation if we continue making plastic bags and stuffing our face with them! #BanPlasticBags NOW. Today is the World Environment Day … another toothless vacuous day of celebrations that have no meaning. As long as tough measures are not taken to ban plastic, to conserve water and to live sustainably, very soon we will have a plastic Earth. We don’t know why Dinosaurs got wiped off, but the most intelligent species to walk the Earth, human beings, will suffocate themselves and all living things on Earth with a plastic bag. 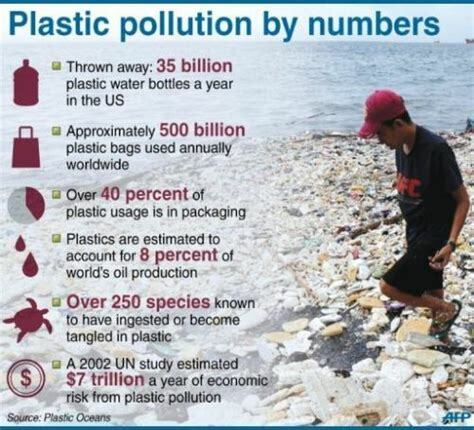 Apocalypse is here – shun that plastic bag today, stop manufacturing and stop using plastic. 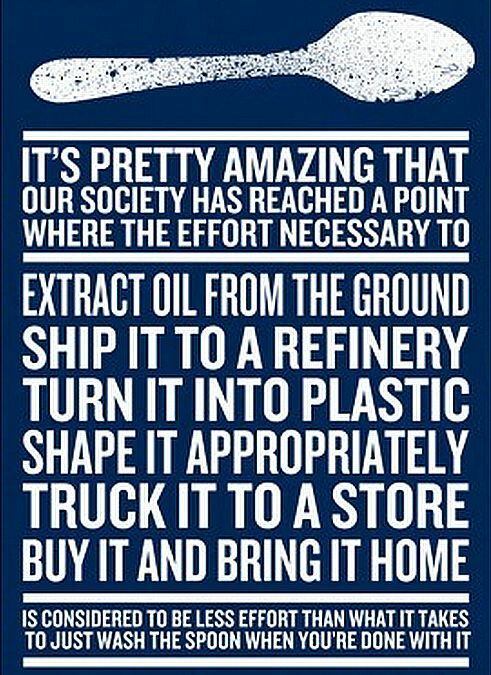 Get rid of plastic from your life before it snuffs out your very life. Till then, celebrate World Environment Day and continue drinking from a plastic bottle, eating from a plastic plate with a plastic spoon and fork, and breastfeed your baby with your milk laced with plastic because you ate seafood and the fish’s belly was stuffed with plastic bags…. that’s how far plastic has entered our lives. Avoid the next world war ! You’ve found one of my pet peeves as well: hotel waste. I have found many places in the US that are even worse: Every day they take away the small bar of soap you took out of the package, throw away the 3/4 bottle of hotel-provided shampoo that you have left and give new ones to you. While some places recycle them and ship them to developing nations, most don’t. And really, that’s a whole other can of worms. Do we really need to be sending crates and crates of soap around the world? Surely there are local producers that don’t generate the same carbon footprint. At one hotel it didn’t matter that I asked, they kept changing the soap. So every morning I would carefully put the soap back in the little box it came in, put it where they leave the soap and carefully put the shampoo bottle back next to the other toiletries so they thought I didn’t use any. Food waste is terrible here by any standard. Canadians waste on average 873 pounds of food per person per year. I just looked that up and my mind is boggled. That’s almost a kilo a day! I will say, though, that I have a great deal of trouble with that – probably largely in part due to relatively infrequent shopping (every 3-4 days) and poor meal planning. Great intentions to cook something turn to a late work day or a lazy night or a missing ingredient and then the next time I look something has gone off. If I’m brutally honest with myself, I think in great part that happens because I can. When we had no jobs and were living in the woods, I can remember no time in which I threw food away. It was precious and costly relative to what we earned no matter what we were eating. Thank you for a thought provoking piece.